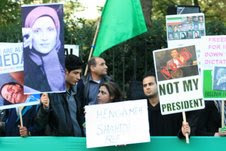 More than hundred supporters of the Green Movement in UK held a protest outside the Iranian embassy in London today in solidarity with Hengameh Shahidi, the Iranian female journalist who has been detained for 100 days now. Hengameh Shahidi, a SOAS university PHD graduate, is also a feminist activist and was Karroubi's advisor on women's affairs. Hengameh's brother, Saeed Shahidi was present at the protest today and spoke about the latest news of his sister who suffers from heart problems and despite many promises by the authorities to release Hengameh on bail, she still remains in custody. Hengameh's 100th day in captivity today also coincided with her 35th birthday. Thank you for the post, it is important for us to know and be updated with all the events that take place concerning Iran. I missed this event because my network does not permit a good flow of information. Where can I find out about future events, such a protests and conferences pertaining to Iran? Kind of fitting that she attended SOAS taht hotbed of support for the Facist Islamic Republic.